These replicas of wicker baskets are wonderful storage solutions. I'm using the smaller one to hold rolled up towels underneath the sink unit. 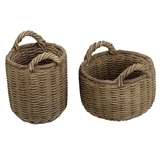 The larger one is perfect for firewood or laundry/clothes/blanket storage. Love these baskets. They look great in so many settings. on 7/9/2017 Really nice product! I have been thinking about buying the two baskets in this set for a long time and I am so glad I did. The detail is amazing!!! Unfortunately, one of the handles on the large basket had broken off during shipping but my husband repaired it with super glue. They were shipped, wrapped in bubble wrap, so I would suggest boxing them instead of wrapping them when shipping. Other than that, I just love them and they will work well in my dollhouse kitchen. I agree with the praises given by the other reviewers. 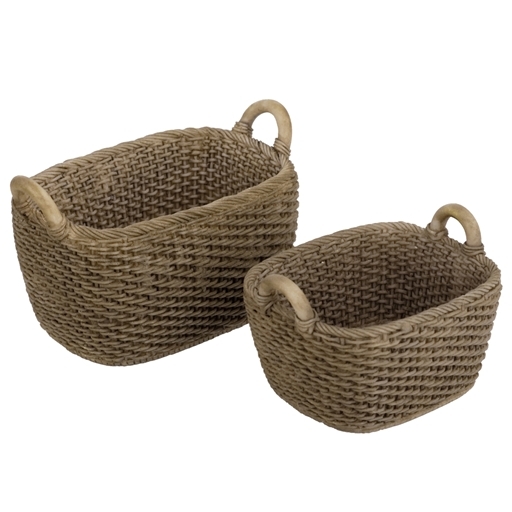 I use the larger one as a laundry basket and the small one for papers "to be filed"
You have to touch these wonderful baskets to know they aren't real woven fibers. They are truly realistic looking.